boogaj: The end of a tradition? The end of a tradition? As most of you in the Chicago area know, Marshall Field's was bought by a big department store conglomerate and they are soon changing the name to Macy's. This doesn't sit well with all the Chicagoans that I've talked to about it. Despite this, we made our annual trek into Chicago to go eat in the Walnut Room at Field's by the big tree. This year it was done all in silver and blue and the ornaments were from Swarovski. It was gorgeous! And the trip wouldn't be complete without a visit to Santa! 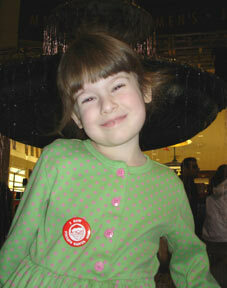 Here is Maddie proudly displaying her "I Saw Santa" pin. It was a lovely day (despite the migraine I had) and the lines weren't unbearable. And now I have a stack of Frango boxes downstairs calling my name -- yum!
. I'm really enjoying it! I'll give a full review as soon as I finish! And tomorrow. . . coffee filter snowflakes! It is truly the end of a tradition, and as a Chicagoan, I for one will miss MF, truly and deeply. I am so glad that you made it to the walnut room........boo hoo, sob, sob.....gulp..........need more wine. Macy's took over a home town store here in Atlanta, too, but it makes me very sad about Field's. I grew up in Illinois and still remember all the wonderful times I had at the big downtown store. My cousin and I would spend hours in the book section, reading Dr. Seuss while our mom's shopped. I saw Santa, ate lunch in the dining room more times than I can count, and am still in awe of the Ladies Lounge. Something is bound to be lost when it becomes Macy's, but I hope they keep more than they change. Thanks for the photo of the tree! Hi Julie, longtime lurker, native Chicagoan, and no, sitting under the tree at Macy's isn't going to cut it. Nope. 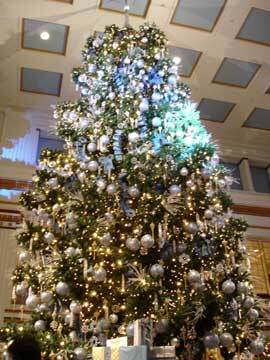 (The Marshall Field's Walnut Room tree even turned up in a sermon I wrote once). I know what you mean. When Marshall Fields bought out Dayton's and changed the name, many, many Minnesotans were pretty upset about it. In fact, I still call it Dayton's most of the time - just out of habit. Now that Macy's bought out Marshall Fields, people are upset here about changing to Macy's. I guess they got pretty attached to that name quickly. We have the same issue here in Maryland, where Hecht's is being taken over by Macy's. We already have some Macy's, and the quality of stuff just isn't as good. Sigh. MF's used to be on my itinerary for every visit to Chicago. Sad that I won't get there ever again.